Every teacher wants and expects his or her students to be reading increasingly complex texts, yet sometimes the gap between our expectations and our students' abilities seems wide and deep. It's tempting to look at that gap and step in to fill it for them, but then we'd be doing most of the "heavy lifting"—the understanding, analysis, and interpretation that our students should be learning for themselves. So how can teachers reverse this trend and ensure that our students are fully entering, absorbing, and experiencing texts? How can we make sure they're making complex meaning "independently and proficiently," as the Common Core State Standards require? Filled with examples of one-on-one conferences, small groups, and whole-class scenarios, this essential book provides an accessible and inspiring model of how—and why—we need to put students at the front and center of our teaching. 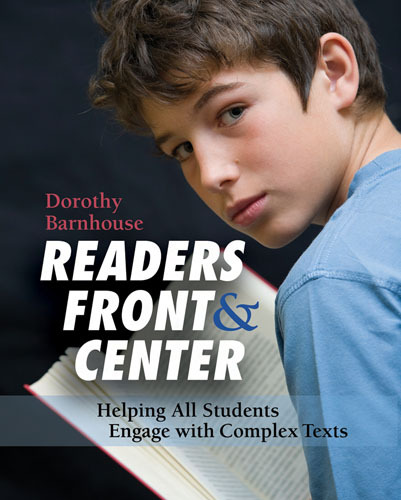 Dorothy Barnhouse is an independent literacy consultant and staff developer. She works closely with elementary and secondary teachers in New York City public schools—and throughout the country—to elevate student reading, writing, and thinking.